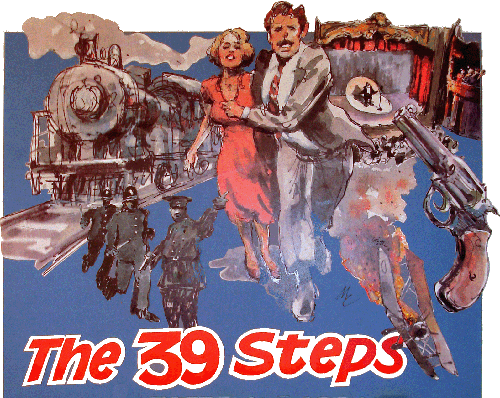 A Tony Award winning comedy thriller, adapted by Patrick Barlow from the 1915 novel by John Buchan and the 1935 film by Alfred Hitchcock, The 39 Steps is a hilarious, comedic, and faithful rendering of Hitchcock’s classic. Barlow based his adaptation on the original concept by Simon Corble and Nobby Dimon of a two-actor version of the play, but Barlow’s version calls for the entirety of the 1935 mystery-thriller film to be performed with a cast of only four playing all 30 characters. Thus the film’s serious spy story is played with tongue firmly in cheek, and the script is full of allusions to (and puns on the titles of) other Alfred Hitchcock films, including Rear Window, Psycho, Vertigo and North by Northwest. One actor plays the hero, Richard Hannay, an actress plays the three women with whom he has romantic entanglements, and two other actors play every other character in the show, including heroes, villains, men, women and even the occasional inanimate object. It is this dexterity that fuels the action for this highly theatrical comedy thriller that includes an escape from a moving train, a leap from a bridge into frigid waters, and a narrow miss with a malevolent airplane bent on destruction. play all 30 characters in The 39 Steps. Pamela and Hannay are handcuffed and on the run. Mr. Memory is introduced by Compere. The agent, Annabella, mesmerizes Hannay. Pamela catches Hannay's attention on the train. Pamela and Hannay meet on the train. Professor Jordan and Mrs. Jordan have the drop on Hannay. Professor Jordan believes he has made a convert in Hannay. "This is the man you want." "This part of his little finger is missing," Annabella (Shaina Zalma Ostroff) tells Hannay (Frank Weidner) as a way to identify the master spy. Hannay confirms Annabella's story, as two "heavies" lurk beneath his apartment window. "This is my home,"' Margaret (Shaina Zalma Ostroff) tells an escaping Hannay (Frank Weidner) after his offer of rescue. Hannay (Frank Weidner) has a moment of rest as he speaks unexpectedly at a political rally while the promoters Dunwoody (Patricia Butler) and McQuarrie (Karl Schott) look on. The "heavies" take Hannay and the unsuspecting Pamela for a ride. The fleeing Hannay (Frank Weidner) and innocent Pamela (Shaina Zalma Ostroff) are entangled in a stile as romantic sparks begin to fly. Featured in the cast are Patricia Butler, Shaina Zalma Ostroff, Frank Weidner, and Karl Schott.